Dave's Part: Bush's inaction on Darfur: a contradiction for the pro-war left? Bush's inaction on Darfur: a contradiction for the pro-war left? The idea of supporting United Nations humanitarian intervention has long been a taboo for the far left. Isn’t such a stance simply a fancy dress version of endorsing the latest imperialist aggression against the third world? Until the mid nineties, I would have gone with the Trotskyist consensus position. I’ve even argued for it in print. It took 800,000 deaths in the Rwandan genocide before I could bring myself to drop the dead dogma. Even now, urging UN invasions is not something I do lightly. After all, Bush and Blair have cynically used the rhetoric of liberation – albeit only after all other justifications had failed – to excuse their oil grab in Iraq. Sadly, a section of the left, who really should have known better, took these claims at face value. But there are occasions when only external forces can stop unspeakable brutality against entire ethnic groups. The current events in Darfur are just such an occasion. That Bush and Blair are doing absolutely nothing to stop the bloodshed underlines just how mendacious their professed concerns for the Iraqi people have been all along, and how monumentally stupid the pro-war left crew have been to take them at face value. 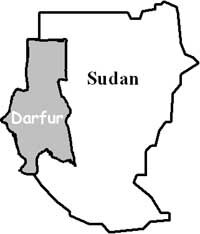 ‘Moves in the US Congress to put financial pressure on Sudan to stop the killings in Darfur have been stymied by big business interests and the Bush administration, according to supporters of legislation blocked in the Senate that would have endorsed decisions by US states to divest from companies involved in Sudan. ‘Tens of billions of dollars in equity are at stake, mostly of non-US companies and including two listed Chinese energy giants involved in Sudan's rapidly growing oil industry which fuels the military with arms and other supplies. ‘On the other side, the National Foreign Trade Council, a US lobby group representing big industries, is fighting the campaign and has sued Illinois. Among the reasons cited by analysts for the White House’s failure to act was Sudan’s oil wealth. Surprise, surprise. Hey, Harry. Nick. Does Bush’s equivocation on this one read like the actions of the liberator you somehow seem to have convinced yourself he represents? Incidentally, companies affected by the divestment campaign include PetroChina, Sinopec, ABB, Alstom, Siemens, Schlumberger, Tatneft of Russia, Italy's Finmeccanica, Weir Group of the UK, and Shell.